"With today’s signing of the landmark Americans for Disabilities Act, every man, woman, and child with a disability can now pass through once-closed doors into a bright new era of equality, independence, and freedom." "If I learned anything from my life before the Senate, it was the value of independent living to persons with disabilities ... meaning living in interdependence with a community." 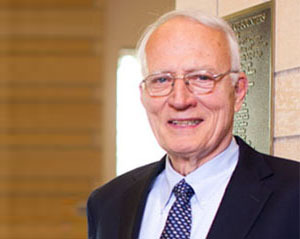 May 9, 1989: Senators David Durenberger (pictured, Minnesota) and Tom Harkin (Iowa) introduced the ADA to the Senate in the 101st Congress. The history of the Americans with Disabilities Act is powerful and complex, its road paved with remarkable perseverance and passion. From its earliest flicker shortly after the passage of the Civil Rights Act to the point where it finally ignited almost thirty years later, the story of the ADA is amply documented. Through the alliances and dedicated engagement of the disability community and its advocates, policies and laws continue to be introduced (and passed) that make life in the United States more equitable for all Americans. The Minnesota Governor’s Council on Developmental Disabilities has compiled a list of “Moments in Disability History” which “have contributed to the forming of American society as we know it today.” The aim of this collection of resources is for use as a foundation for self-education and to assist the disability community in creating future policy. 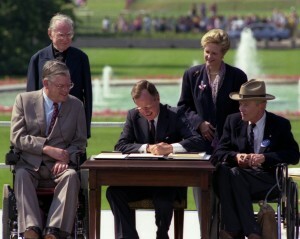 A 1997 report by the National Council on Disability titled “Equality of Opportunity: The Making of the Americans with Disabilities Act” is a comprehensive, historic overview of the ADA. From the June 2015 issue of The Federal Lawyer, “How the ADA Was Passed (PDF)" is a concise overview of the events leading up to the signing of the ADA in 2009.